Neutron stars contain the most dense observable matter in the universe. They cram more than a sun's worth of material into a city-sized sphere, meaning a few cups of neutron-star stuff would outweigh Mount Everest. Astronomers use these collapsed stars as natural laboratories to study how tightly matter can be crammed under the most extreme pressures that nature can offer. "This is fundamental physics," says Sudip Bhattacharyya of NASA's Goddard Space Flight Center in Greenbelt, Md. and the University of Maryland, College Park. "There could be exotic kinds of particles or states of matter, such as quark matter, in the centers of neutron stars, but it's impossible to create them in the lab. 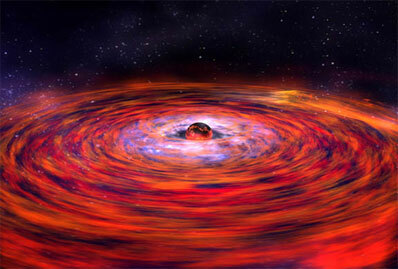 The only way to find out is to understand neutron stars." Previous X-ray observatories detected iron lines around neutron stars, but they lacked the sensitivity to measure the shapes of the lines in detail. Thanks to XMM-Newton's large mirrors, Bhattacharyya and Strohmayer found that the iron line is broadened asymmetrically by the gas's extreme velocity, which smears and distorts the line because of the Doppler effect and beaming effects predicted by Einstein's special theory of relativity. The warping of space-time by the neutron star's powerful gravity, an effect of Einstein's general theory of relativity, shifts the neutron star's iron line to longer wavelengths. A group led by Edward Cackett and Jon Miller of the University of Michigan, which includes Bhattacharyya and Strohmayer, used Suzaku's superb spectral capabilities to survey three neutron-star binaries: Serpens X-1, GX 349+2, and 4U 1820-30. This team observed a nearly identical iron line in Serpens X-1, confirming the XMM-Newton result. It detected similarly skewed iron lines in the other two systems as well. The XMM-Newton paper appeared in the August 1 Astrophysical Journal Letters. The Suzaku paper has been submitted for publication in the same journal.